As Texas' drought wears into its third year, the state is locked in a legal conflict over water with New Mexico, and a North Texas county is suing the state of Oklahoma to get access to a vast amount of water. As Texas' drought wears into its third year, water fights are accelerating within the state as farmers, cities and industry compete for limited supplies from dwindling reservoirs. But many of these seem like small-scale skirmishes compared with the complex and high-stakes battles along Texas' borders that stem from pacts signed decades ago. Texas is currently locked in a legal conflict over water with New Mexico, and a North Texas county is suing to get access to a vast amount of water — more than 460,000 acre-feet, equivalent to a year's supply for several Austin-size cities — from Oklahoma. Mexico is also delivering water from the Rio Grande to Texas at a slower than usual rate. Along the Texas-New Mexico border, the rhetoric is particularly heated. Last week, Texas filed a lawsuit with the U.S. Supreme Court that accused New Mexico of failing to deliver water from a reservoir along the Rio Grande known as Elephant Butte. New Mexico's attorney general, Gary King, called the move "tantamount to extortion" and harmful to New Mexico's farming interests. Texas counters that in accordance with a 1938 Rio Grande Compact, the water should be going to Texas farmers rather than being held in New Mexico. 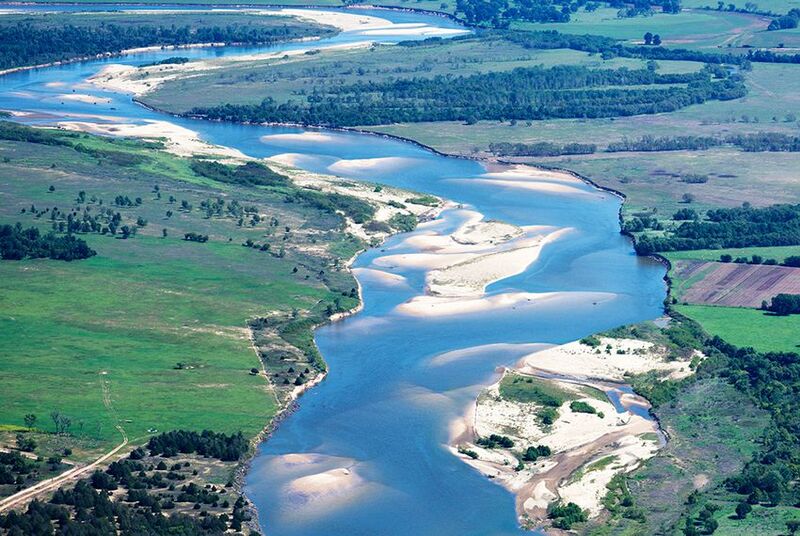 In another case, which the U.S. Supreme Court recently agreed to hear, Tarrant County, which includes Fort Worth, wants Oklahoma to sell water from Red River reservoirs to the county. But Oklahoma has refused to sell water to the county, and Tarrant County sued. The case, which stems from a dispute over a 1980 Red River compact, began in 2007, and Tarrant County has lost in lower courts. The U.S. solicitor general had recommended the high court hear the case, which could have broader implications for other multistate water pacts around the country. Battles over border water increase in times of drought, and so do the number of lawsuits and proposed laws that affect water use, preservation and distribution, according to Martin Rochelle, a water attorney in Austin. And with a drought that some experts predict could last until 2020, cross-border water relations will remain complex. "Most of the important water laws have been passed during periods of drought, when people are focused on it," said Glenn Jarvis, a McAllen attorney who works on water issues. "With the drought we're in now, people are more likely going to be more focused on it and be inclined to do something about it either legally or in the courts." “Texas is aware of that, Mexico is aware of that, and we’ve been sitting down and talking about ways we can better understand the status of the basin,” said Sally Spener, a foreign affairs officer for the International Boundary and Water Commission, which oversees water agreements between the U.S. and Mexico. In the late 1990s and early 2000s, Mexico was behind schedule on water deliveries at the end of the five-year cycle and eventually made it up. Jarvis, the McAllen attorney, said it is too early in the cycle to tell what will happen. Texas is mindful of the challenges that extreme drought has posed for Mexico, he said. The difficulty of managing water agreements across borders increases when it's between countries rather than states, Jarvis said. “When [treaties are] not enforced, you almost have to have more of a diplomatic solution rather than a court solution,” Jarvis said. There is a bit of good news along Texas' eastern borders because of the vastly different hydrologic climate in East Texas: Experts say there have been no major disputes between Texas and Louisiana or Arkansas over border water — yet. * Editor's Note: An earlier version of this story said that Tarrant County was suing the state of Oklahoma for access to more than 460 million acre-feet of water. The figure should be 460,000 acre-feet.